Travel in style when in Savannah. There is something magical about being driven through lovely historic Savannah in a horse-drawn carriage. The sound of hooves echoing on cobblestone streets instantly transports passengers back in time. The slow pace encourages passengers to fully absorb their surroundings. Historic architecture, moss-laden trees, the very scents and sounds of Savannah – all are better when experienced in an open carriage. Horse-drawn carriages in Savannah transport newlyweds, retirees, and vacationing families. You can indulge in a carriage tour no matter why you’re traveling to Savannah – even business travelers have spared an hour or two to tour the city in style. So when next you stay in one of our Savannah Vacation Rentals, give Carriage Tours of Savannah a call. History Tours lead past stately old homes and lush parks. Evening Ghost Tours are full of haunting tales. Have a horse-drawn carriage take you from one of our Savannah Vacation Homes to your wedding ceremony, or from your wedding ceremony back to our vacation home for a reception. Tour the city with a lover, with your parents, or with friends. It’s a fun trip no matter what. 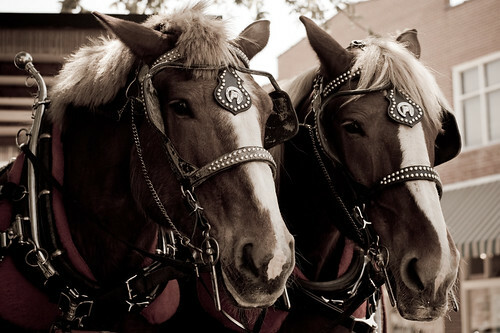 Additional information is available at Carriage Tours of Savannah.